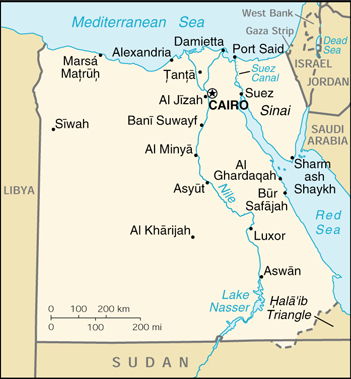 Background: Nominally independent from the UK in 1922, Egypt acquired full sovereignty following World War II. The completion of the Aswan High Dam in 1971 and the resultant Lake Nasser have altered the time-honored place of the Nile river in the agriculture and ecology of Egypt. A rapidly growing population (the largest in the Arab world), limited arable land, and dependence on the Nile all continue to overtax resources and stress society. The government has struggled to ready the economy for the new millennium through economic reform and massive investment in communications and physical infrastructure. Economy - overview: A series of IMF arrangements - along with massive external debt relief resulting from Egypt's participation in the Gulf war coalition - helped Egypt improve its macroeconomic performance during the 1990s. Sound fiscal and monetary policies through the mid-1990s helped to tame inflation, slash budget deficits, and build up foreign reserves, while structural reforms such as privatization and new business legislation prompted increased foreign investment. By mid-1998, however, the pace of structural reform slackened, and lower combined hard currency earnings resulted in pressure on the Egyptian pound and sporadic US dollar shortages. External payments were not in crisis, but Cairo's attempts to curb demand for foreign exchange convinced some investors and currency traders that government financial operations lacked transparency and coordination. Monetary pressures have since eased, however, with the 1999-2000 higher oil prices, a rebound in tourism, and a series of mini-devaluations of the pound. The development of a gas export market is a major plus factor in future growth.